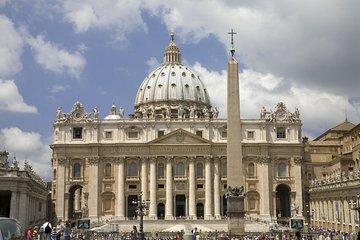 Bekijk de topattracties van Vaticaanstad met een privé-rondvaart door de Vaticaanse Musea, de Sixtijnse Kapel en de Sint-Pietersbasiliek. Verken de uitgebreide collectie in de Vaticaanse Musea met je deskundige gids. Rond uw museumbezoek af met wat tijd in de indrukwekkende Sixtijnse Kapel om de fresco's van Michelangelo te bekijken. Ga verder naar de Sint-Pietersbasiliek naast de deur om de kunst in de grootste kerk ter wereld te bewonderen. This tour was amazing! Mido our tour guide was awesome! His knowledge was simply unbelievable ....there was no question he couldnt answer! Kind and friendly he guided us beautifully through it all even with my lousy knee! Would do again in a heartbeat! Incredible. Worth every penny. I highly suggest this tour. Having a private tour was fantastic. No headphones, no large crowds all trying to see the work of art at the same time, and being able to ask any questions without feeling like you're monopolizing the guide were all great benefits. Our guide had great information, was very friendly, and gave us an experience that was far better than the typical large tours.